In a recent article, my business partner discussed how to set-up a pay-per-click advertising campaign on Bing Ads. In this article, I am going discuss issues surrounding bidding strategy. This article will again focus on Bing Ads, however, the principles discussed in this article can be applied when using Google Adwords as well. Get $100 in free search advertising from Bing Ads when you spend $25. At the time this article is being written, Bing Ads is a sponsor of Fit Small Business. However, Fit Small Business only recommends products and services in which we believe. For most local small business, we think that pay-per-click (PPC) advertising on both Yahoo Bing Network and Google is the right solution because you can get about 100% coverage or search traffic in marketplace. The problem for most local businesses is not going to the expense of advertising, but, finding enough quality clicks to buy via search engine marketing. However, if my budget was really tight, let’s say $100 per month, I would advertise with Bing Ads because buying clicks from Bing Ads is cheaper. 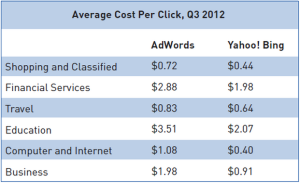 Below are the average cost per click numbers as reported by AdGooroo. As you can see, the cost per click on Bing Ads can be less than half of Google. There is a simple reason for this difference in cost. Only 55% of the advertisers using Google, also have a campaign running on Bing Ads. Less competition means lower costs. How much does it cost to advertise on Google Vs Bing Ads? Where to set your budget for your PPC campaigns? Start with a $15 per day maximum budget ($450 per month). Figure out before you start what you are comfortable paying to acquire a new client. For a local brick and mortar business, I would initially start my budget with $15 per day. Assuming that you can buy clicks for between $0.50 cents and $3.00, a potential budget of $450 per month will provide you enough data to gauge the initial success of your campaign. There are some industries where buying clicks can be much more expensive. 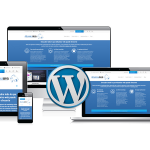 For example, I have heard that some local moving companies will pay as much as $15 per click. If you are in a highly competitive industry where each sale is worth big bucks, the budget you will need to allocate initially will increase. At the end of the day, it all comes down to revenues and profits. How much are you willing to spend to acquire a new customer? Lets say the typical new customer generates $100 in profits per year, not including the expense of acquiring the customer. You probably don’t want to give up all your profits on marketing. Let’s say you are willing to spend up to 50% of the profits that a new customer generates in the first year on acquiring them. Your maximum spend is therefore $50 per client acquisition. The goal of the initial budget is to give you enough information to see if you can achieve that goal. Assuming you are able to acquire clients for below the maximum amount that you are willing to pay, PPC advertising poses a very difficult question; Do I care more about acquiring clients or maximizing profitability? Because of the way pay-per-click advertising works, the more clients that you want to acquire, the more expensive acquiring them becomes (technical explanation later). When you start off, we suggest not worrying about maximizing profitability, but focusing on achieving a cost per (new client) acquisition goal. If your pay per click advertising meets the goal, then increase the budget. Select the pre-pay option without using the autopay option. Set daily spend limits for the campaign. Imagine having a bill for several thousand dollars in pay-per-clicks ads when you only have the budget to spend a few hundred dollars per month. Unfortunately, many people have been surprised by big bills. However, there is no reason why you ever have to be surprised. Below, I will be recommending a double safe-guard. There is a downside to what I am about to recommend. You might miss out on some clicks. With Bing Ads, budgets are set-up on a campaign basis. If you have three campaigns set-up in one account, your maximum spend is the combined total of all three campaign budgets. (At this time, there is no option for an account maximum limit. However, our second safeguard effectively creates an account maximum spend.) Campaign budgets can be set-up to be daily or monthly. WIth a monthly budget, there is a chance to blow the entire budget in the first few weeks of the campaign. So I suggest going with the daily limits. Daily and monthly limits come in two varieties: Accelerated (spend my money ASAP) and Standard (try to run ads to make the budget last the entire day or month). We suggest standard, as running an accelerated campaign will use up your budget in the morning. While there is nothing wrong with getting clicks early in day, your best buyers might (or might not) be those searching for you at night. When you initially set-up the campaign, you will have the option of setting the campaign as prepay or postpay. Once you make the designation, keep in mind that you will not be able change it for the account. With prepay, you pay in advance and as clicks are generated the cash gets drawn down from the prepaid amount. As long as you don’t set-up auto billing on the account, the amount that you prepay serves as your maximum account budget. If you’re regularly hitting your daily budget and achieving your cost per acquisition goals, you can increase your daily budget and make prepayments more regularly (in advance of running out of funds). This will reduce the amount of lost clicks while protecting you from big charges. How many clicks will I get from search engine marketing? 1) Your budget. Obviously, you can buy clicks if you have have enough money in your account to pay for them. 2) The traffic and search intent. Every keyword has a certain amount of search engine traffic. This is a limiting factor in terms of the number of clicks you receive. Research indicates that when people use a search engine, 94% of the time they will click on an organic result (non-paid) and only 6% of the time a paid ad. (eConsultancy) However, that is for all searches. For searches that have a high commercial intent (ie “Park Slope Realtors”) according to Wordstream around 65% of the time searcher will click on paid advertisement. In other words, if there are 100 searches for the term “Park Sloper Realtors” there should be about 65 paid clicks generated. 3) The ad copy. Are you providing the viewer a compelling reason to click? 4) Positioning. The number of clicks which an ad generates is highly correlated with its position on the page. The closer to the top of the page, the more clicks the advertisement will receive. The following comes from Chitika Advertising Network. Your maximum bid is the highest amount that you are willing to pay for a click. However, bidding more than anyone else for a specific keyword is not going to guarantee you the top spot, or even that your ad is shown when searches are conducted for the terms. Bidding is an extremely important factor, but so is how compelling your ad is and the quality of your content. What’s the logic behind this? Bing Ads and Google have two objectives: To maximize their revenue and to provide a good experience to their users. Making a determination on the highest bid alone would not maximize revenue for them because, an advertisement with the highest bid could have a very low click-thru rate (percentage of people that see the ad and then click). An ad with a lower bid but a higher click thru rate can often result in more revenue than and ad with a higher maximum bid. How relevant is the ad to the search being conducted? How relevant is the landing page to search being conducted? How high quality is the content on the landing page? There is no guessing about the quality score. Bing Ads will let you know the quality score on a keyword by keyword basis. Quality scores are recorded on 1 for 10 basis. If your score is less than a seven, you should try making changes to the ad copy and landing page. Take Away: Relevance of the ad and landing page to the search makes a big difference. With that said, bidding is certainly the easiest factor to change. Bidding can be done in two ways. You can set-up bids for an ad group. The bids will apply to all the ads in the group. Or, you can place bids on individual keywords. When you manually set the bids for words, it overrides the settings of the adgroup for that particular words. Start in 2nd or 3rd position. Bid based on the value of the click to you after you have data. I highly recommend that you don’t try to get the top spot when you start using pay-per click advertising. 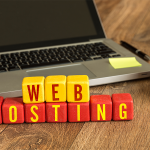 Getting the top listing has two drawbacks: one is it’s going to more expensive than being in a lower listing and two the quality of the clicks can sometimes be much lower than being in the number two or three position. Many people click on the first listing that appears when they do a search, without necessarily reading the advertisement and seeing if what’s being advertised applies to them. If they click on the second or third advertisement down it can be inferred that they are reading the advertisements and choosing to click on the ad. This results in a higher quality visitor. A study by Engine Ready of their clients showed that those clicking on the second advertisement converted (took a desired action) at a 20% higher rate than the those clicking on the top ad. While being in the 4th or 5th ad can be even cheaper than the second or third, it probably is not going to generate a meaningful amount of clicks. 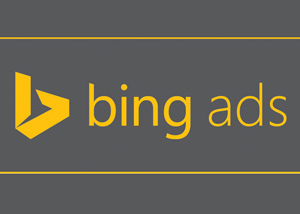 Bing Ads provide a tool which provide the approximate bids that you will need to be in each position. However, its only approximate and doesn’t take into account quality scores or the historical CTR of the other bidders. In other words, to get your campaign in the desired position will require a bit of playing around with the bids. After you let the campaign run for a month, it might be time to take a look at positioning. If you’re easily beating your cost per new client acquisition, its probably time to move up a position and get that extra volume. Being in position one should almost double the number of clicks. On other hand, if the numbers are too high moving down positions might make sense. Learn how to get $50 in free search advertising from Bing Ads.